A four day break to Holland that takes in a full day to the the bulbfields and a full day in Amsterdam. The most important thing about spring in Holland is, of course, flowers - and there will be flowers galore. 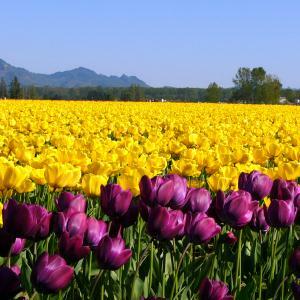 We will visit the world famous gardens of Keukenhof, the bulb grower's magnificent display of all the different tulip, daffodil and hyacinth varieties - over 6 million bulbs are planted annually and Dutch horticulturalist Piet Oudolph's Nursery. The grand gardens of Het Loo Palace are now recognised as one of Europe's finest formal gardens, a late Dutch interpretation of the Italian-French garden dating from the first quarter of the seventeenth century. Travel from your local joining point to Hull for a late morning crossing to Zebrugge. Onward to the Holiday Inn @ Leiden, our chosen holiday hotel. 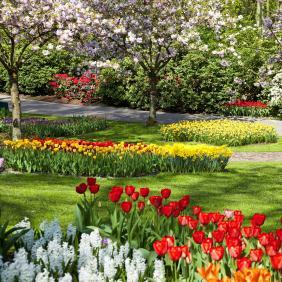 A day in the Bulbfields, visit Keukenhof Park with entrance included. Included excursion to Amsterdam where you will have free time to explore alone. During the day you will have the chance to see more of the city on an optional cruise along the networks of canals in one of the famous canal boats. Up and off with the larks, retracing our journey through Belgium and Zebrugge with time for a short visit to Brugge. Enjoy a meal on the ferry and arrive home in Yorkshire at around 10:00pm. This break is situated in the Holiday Inn at Leiden - which is centrally located between Amsterdam and the Hague and is only a few minutes drive to the bulbfields..
Leiden is known for being the birthplace of Rembrandt and is also famous for it's cobbled streets, beautiful canals and many museums. Holiday Inn Leiden offers 200 comfortable hotel rooms with air conditioning, a variety of leisure facilities, a stylish Garden restaurant, a convivial Ocean bar and a gift shop. For your relaxation the hotel offers it guests tennis (in/outdoor), squash courts, mini gym, indoor swimming pool with sauna all within the hotel complex.